To begin this pitching series let’s start by defining what a pitch shot is. Simply, the definition of a pitch shot is a shot that has maximum air and minimum roll on its way to the hole. So in other words a pitch shot generally makes the ball fly two thirds in the air and one thirds on the ground to the hole. A chip shot is the reverse of this because the ball travels only about one third in the air and two thirds on the ground rolling to the hole. Generally a chip shot is played with a 5, 7 or 9 iron. These lower lofted clubs make it easy to keep the ball low to the ground. But for pitch shots you need to use a club with more loft on it (e.g. pitching, lob wedge) to give the ball the 2/3 air time that is needed. During the course of a normal game of golf you might encounter a short shot where your ball has to fly over a a knoll, or the edge of a bunker, or a pond, or high rough etc., etc. When you’re confronted with a shot like this you need to hit a pitch shot that has a higher trajectory and makes the golf ball land softly. The lofted clubs like the pitching, sand and lob wedges are the clubs designed for the higher shots so they’re the one’s you need to use to hit pitch shots. The ability to pitch a golf ball in the air with trajectory, a soft landing and the correct distance is one of the game’s more difficult shots. Even the top pro’s struggle with this shot at times. But if the golf ball is sitting up in light rough it makes the execution of a pitch shot much easier over trying to hit a pitch from a hard pan lie. Unfortunately most times you need to hit a pitch shot the golf ball will be either sitting down in deep rough or on a hard pan lie. In either instance the shot becomes very difficult to hit the correct trajectory and distance. However; if you use the correct technique and some practice you can learn to hit great pitch shots no matter what your handicap is. When you think of pitching the golf ball keep in mind what you are trying to accomplish, a golf shot that travels mostly in the air and then rolls a short distance. Ok, let’s get into more of the nitty gritty of how to hit pitch shots. When you are faced out on the golf coruse with a shot that requires more time in the air than on the ground there are three or four clubs you can choose from. Most sets of golf clubs come with a pitching wedge and sand wedge. In the past 20 years the LOB and gap wedges have become very popular. The LOB wedge will give you that extra loft the sand wedge won’t. The gap wedge is a wedge that fills in the space between the pitching wedge and sand wedge. Let’s start with the LOB wedge; most LOB wedges have 60% of loft. If your next wedge is a sand wedge it should have about 56% of loft, the gap should have about 52% and the pitching wedge at 48%. The 4% increments has to do with the distance you can hit the ball with a full swing. When you hit all of your pitching clubs with a full swing they should be about 10 yards apart. On less than full swings the balls will end up closer to each other. Before you go and purchase any new wedges there is one last item you need to understand. Some wedges are forged and some are cast. A wedge that is forged is made of softer metal. If you are going to purchase a wedge try and find a forged club and not cast. It is more difficult to stop a ball using a cast wedge. 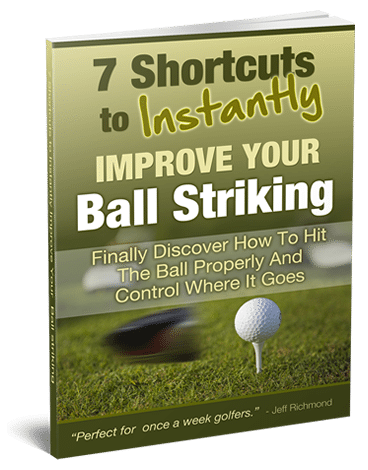 The golf ball you play with makes a huge difference when you are trying to hit a soft pitch shot around the green. There is one huge problem with golf balls that most average golfers have and it’s a double edge sword. 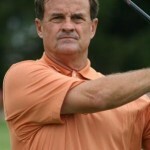 You see, if you play a two piece golf ball, you will gain distance off the tee and in your full swing but it is very difficult to stop it compared to a solid golf ball. 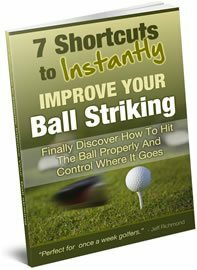 You should experiment with different golf balls to find out what works best for you and your golf game but you need to decide if distance is more important than your short game. In the next lesson of this pitching series we’re going to look at the setup needed to hit great pitch shots.